Autumn is taking an almighty long time to get underway this year. Global warming isn’t all melting glaciers and rising sea levels; there are some benefits to be derived from it as well, at least thus far. But the temperatures are dropping and the space heating systems are beginning to crank up again all across the UK. And always at this time of year condensation starts rearing its mouldy head once more. Across the country, there are outbreaks of dripping bedroom ceilings, rank clothes in cupboards and smelly, dank carpets. In an attempt to shed a little light on the matter, I have included a free-to-download psychrometric chart, which enables you to predict dew points. If you can’t actually see it too clearly, click on the chart and it should open in a separate window, which should allow re-sizing. So what is a psychrometric chart? What it shows is the amount of moisture that can freely float around in the air at any given temperature. The topmost curved line represents the saturation point, or the 100% relative humidity level. If there is more water vapour than the air can hold at the given temperature, then the vapour condenses. That is the basic mechanism behind condensation. Now most homes aim to be around 20°C, at least when the heating is turned on. And most British homes happily subsist at relative humidity levels between 40% and 60%. These are what we would instinctively call comfortable. Now, if you turn the heating off and let the temperature fall, without changing the air in the room, the absolute amount of water vapour in the room is unchanged but the relative humidity level starts climbing. As the room gets colder, the RH level gets higher and higher until eventually it reaches saturation or dew point. On the chart, you draw a line westwards from the nice comfy 20°C, 60% RH, and you can use this to predict at what temperature condensation will start happening. 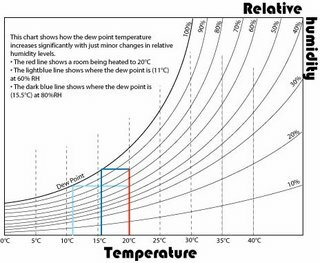 The blue lines show two scenarios for a cooling room. If you are suffering from condensation, I suggest that the first tool in your armoury should be this chart. Next get a cheap hygro-thermometer from someone like Thermometers Direct. This will tell you what is happening in each room in terms of both temperature and relative humidity. Armed with these, you are ready to become a moisture sleuth. You yourself can work out just why exactly you are getting condensation. And what you need to do to avoid it happening in future. Keeping the room warm enough to prevent any surfaces reaching dew point is an obvious way of stopping condensation. But some badly insulated walls and ceilings can be difficult to keep sufficiently warm– remember condensation usually starts on the coldest surface. The other method used to eliminate condensation is to reduce the amount of water vapour in the room: at its simplest, this means opening a window and exchanging the warm moist air inside with some cold damp air from outside. Whilst this may seem counter-intuitive, the chart shows that the cold air outside holds far less water vapour, even though it may be close to saturation. More expensive options include whole house ventilation systems that can be an almighty hassle to fit into an existing house. There may be some very simple solutions staring you in the face such as keeping all the internal doors open and thus evening out the humidity levels across the whole house rather than letting them build up in one place. Housebuilder magazine (Oct 2006) has published a short article by Graeme Owen of BSRIA about how new homes are doing in the airtightness stakes. The tests were carried out before the new requirement for airtightness testing came into effect but nevertheless the results are dramatic. The pass rate, set out in Part L1A, is 10m3 per hour per m2 of heated envelope at 50 Pascals of pressure, which is such a mouthful that it is now being reduced to 10 q50. Energy wonks don’t regard this as very demanding: the best practice low energy homes score as low as 1.5 q50. Nevertheless, many of our new homes struggled to make it through the new hurdle. All but 3% of timber frame homes achieved a pass and as many as 73% of timber frame homes tested achieve a score of 5 q50 or less. 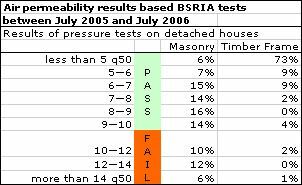 In contrast, 28% of masonry homes failed the new standard and only 6% met a score of 5 or less. Why the huge difference? Well there is a clue given in the article. Apparently, the masonry build data was further broken down into houses which were wet-plastered and those which were dry-lined, using plasterboard stuck on with dot and dab. The wet-plastered houses achieved a pass rate comparable with timber frame: the dry-lined homes most certainly didn’t. To build airtight with dry-lined walls, you need to seal around all the edges, something that has very rarely been done till now. I get contacted on occasion by TV producers wanting me to source chaos and disaster on the nation’s building sites. Sometimes I can’t be arsed to do anything about it but, if the idea sounds like a good one, I’ll do what I can to summon interest. This idea sounds like a good one. Trouble with your Building Job? — Work not quite going to plan? — Do you need help managing the project? Channel 4 TV is currently producing a primetime series about domestic building jobs that have gone off the rails. We are looking at cases where a stalemate has arisen between builder and homeowner and both parties feel they’ve reached a deadlock. Our aim is to put the project back on track with the help of a leading building industry mediator – free of charge. The series will address the common pit-falls that arise and promote good building practice. Please contact Dan Marshall on: 0207 907 0894 or email dan@bettytv.co.uk All calls will be treated in the strictest of confidence. Following on from my last post, the Windsave surveyor came today, took one look around the house and said “Sorry, no can do.” The reason our house fails the Windsave test is that the upper storey is covered in timber clapboarding and that isn’t felt to be strong enough to hold onto a windturbine. I can get a full refund but I have to go back into B&Q in person to collect. There were lots of questions I wanted to ask this guy but there didn’t seem to be a lot of point. “Will it be noisy?” or “Will it attract lightning?” seem a bit pointless if you aren’t going to have one. And, to be honest, I am not sure this guy would have known the answer in any event. He was just there to make an assessment. I don’t think he had been working for them for too long and I suspect he wouldn’t have known the answers. But I did manage a couple of questions. One was “Do they need planning permission?” He reckoned not, unless the house was listed or in a conservation area. This conflicts with my local council: I phoned them earlier in the week and they didn’t sound very sure but advised me that it would fall outside the normal permitted development rights and would therefore require a planning application. I also asked him how busy he was. The answer was very busy. He has done 30 visits in the last two weeks. He also said there have been 28,000 enquiries logged via the Windsave website. Now I haven’t been entirely somnolent since my visit to B&Q last week. And I expect that this casual claim is the reason that Windsave is attracting so much attention. The payback suddenly looks pretty attractive, especially when installtion grants are taken into account. But is it accurate? Just how much power can something like this produce? So you go scurrying around looking for average wind speed data. It’s there, on the DTI website, if you can handle converting a postcode into a Landranger co-ordinate. Ours is just 5.1m/s, on the low side but pretty typical for lowland England. The likely output is calculated from the average wind speed — Windsave seem to suggest you get a little bit more than you might expect. Their website is fairly helpful in this respect. But there can be no guarantee that you will get what it says on the tin and thus, even with the most sophisticated calcs, you can really only make a rough approximation of likely output. Nevertheless, you can see that at an average windspeed of just 5.1m/s, we were never going to get that much power out. Possibly 1,000kWh per annum, if we were lucky. Probably rather less. Enough to power the proverbial 60w light bulb but not much more. Having said that, if we lived somewhere where the windspeed was higher, even by just 1m/s, we could be getting three or even five times more power out of it over the course of a year. But I suspect that such locations are few and far between. I hadn't realised just how crucial the average windspeed data is in analysing the cost effectiveness of a wind turbine, but it is the No 1 critical factor. It's something that Windsave don't highlight, but arguably should. God help me, I’ve gone and bought a rooftop wind turbine! Windsave roof mounted wind turbine on display. I got talking to a bloke called Malcolm, who was sort of in charge (it was the first day of this promotion) and the next thing I knew, I had bought one. It's only £1498, inc VAT and installation. I figured there wasn't that much to lose. I mean, what are credit cards for if not the odd spontaneous splurge? I got home. Then the doubts really started to kick in. How can it possibly generate any sensible amount of electricity? Will the neighbours think I am being a poser? Or a Tory? Will it make a noise and keep us awake at night? Will it attract lightning and blow all the power out? Will it pull the gable wall down? What will the insurance company make of it? Have I gone stark raving bonkers? The Mrs was not best pleased. D-Day is this Thursday when "an assessor" comes along to take a look at our house. I am rather hoping that he says we are not a suitable case for treatment and that I can have my money back and that I can write the whole thing off to experience. But another part of me is secretly hoping that it works as advertised. Wouldn't it be brilliant if it does? Then I can leave the computer in sleep mode all night long and not feel guilty. I am none too happy about paying in advance for anything. Paying in advance for a wind turbine that may be unsuitable and, even if it is, will probably require planning permission seems pretty outrageous. But on the other hand, it is so cheap, I can't quite see how Windsave could possibly make any money out of it without taking cash upfront. And I feel much happier about trying to get a refund from B&Q than I do from a small business in Scotland. Will report more after our Thursday feasibility study. Two weeks ago the government moved to prohibit the use of multifoil insulation in roofs. They wrote to all the local authority building control departments and to bodies like the NHBC, concerned with the policing of our building standards, and told them that they could no longer accept the use of Actis Tris Iso Super 10 and similar products as an adequate method of insulating roofs. In future all insulation must meet the standards laid out in BR 443, requiring hot box tests to be carried out. Multifoils do not perform well in hot box testing and instead have relied on comparison testing, where the material is used head-to-head with other insulators in similar roofs and measurements are taken of energy usage. Mutilfoils have had a very good run in the UK. Most other countries – at least the ones that take these things seriously — have given them short shrift. But Actis gained a toehold in the UK by gaining third party approval from BM Trada, who witnessed the comparison roof tests and verified that the performance of their multifoil was as good as 200mm of mineral wool. This test, carried out nine years ago, has been the subject of much heated debate ever since: there have been many sceptics who suggested that the mineral wool was pulled well and truly over the eyes of the witnesses. Yet, on this basis, Actis and others have sold hundreds of acres of their multifoil products. Builders like them because they are no more than 25mm thick and are very quick and easy to fix and are especially good in situations like loft conversions where headroom considerations make other thicker insulation problematic. And indeed, I have spoken with several customers who have been delighted with the thermal performance of their multifoiled roofs. But this doesn’t prove anything, as it is notoriously difficult to measure the thermal performance of just a part of a structure. Aware of their precarious position, the multifoil suppliers formed themselves into a Confederation of Multifoil Manufacturers with a brief to persuade the powers-that-be that multifoils were as good as they claimed and not some elaborate con. They did very well. They were given an extension till Jan 1st 2007 to prove their case. But sometime in September, the position of the legislators hardened and this extension has been removed.